It can be hard to keep your bathroom clean, especially since it is always in a damp or wet state. 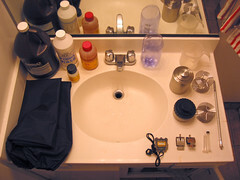 A bathroom is the place where you can clean yourself and relax, so it is important that your bathroom is clean as well. This is why you should go through bathroom mold removal. If your bathroom has mold in it, it doesn’t matter how much you clean it, it will not be totally clean until the mold is gone. If you took a lot of effort to try and make your bathroom look clean and tidy, then mold can definitely spoil your day. Also, if your bathroom is made so that it is full of nice looking bathroom decorations and accessories, you definitely do not want to have mold growing on it and making it not only disgusting but unusable as well. Mold is not only going to make your bathroom look dirty and messy, but it can also cause a lot of problems to your health. If you are allergic to the mold, then an allergic reaction could occur and you could be facing a life or death situation. Mold releases dangerous chemicals as well as spores, so you should get rid of it as soon as possible. The reason that mold often grows in bathrooms is because the bathroom houses the perfect environment for mold to grow in. The bathroom is quite damp since it is often wet also, there is not a lot of air coming in since bathrooms don’t have a lot of windows. Also, the warm environment with a humid atmosphere as well as not a lot of excess light helps encourage mold growth. If you find that there is mold growing in your bathroom, it is important that you make sure that the growth is stopped as soon as possible. It is important for you to make sure that your bathroom is always well ventilated and is dry and clean. When you are not in the bathroom, you should open the windows and put on a fan so that the air flows through the room. It is also important for you to constantly clean your bathroom at least once a week so that the mold will not have a chance to grow. You should get rid of all the soap suds in your bathtub when you clean your bathroom, since mold grows on soap residue. You should also keep your bathroom lit so that the mold doesn’t grow. If you find bathroom mold, you will need to scrub it off with a mold removal. Make sure to wear rubber gloves and a mask so that you will be protected from the mold. The products to remove mold can be found in different local stores, so it shouldn’t be a problem to find any. If you can’t get any bathroom mold removal products, you can choose to use vinegar to remove the mold. It is a simple and natural method to remove mold. You can also use baking soda to get rid of the mold as well. This entry was posted on Wednesday, August 25th, 2010 at 6:57 pm	and is filed under Mold Removal. You can follow any responses to this entry through the RSS 2.0 feed. You can leave a response, or trackback from your own site.